The Solar Water Pump Shurflo Premium 2088-514-145 are considered the workhorse of the small diaphragm pumps. They are used in a variety of transfer and dispense-on-demand applications where flow up to 3.6 gallons per minute is required. Applications include RVs, remote homes and cabins, and marine. 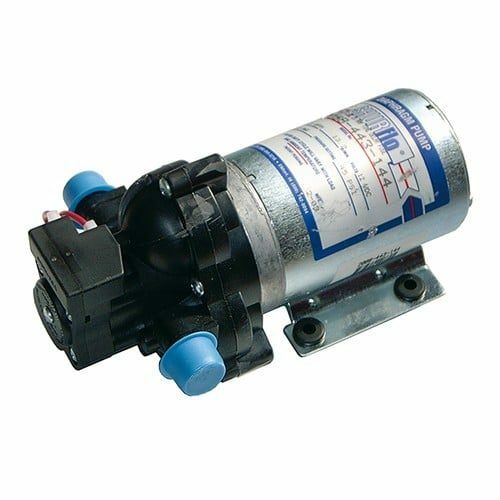 These Solar Water Pump Shurflo Premium 2088-514-145 are not designed for continuous heavy duty use. For added reliability the Heavy Duty Strainer (252-3300) or the Twist-on Strainer (170-061- 09) can be used on the inlet port. Install the optional 4 heat sink (34-007) for heavy duty applications where extra cooling is required. The 2088 is our most popular line of small delivery pumps. From that innovative pump directed into the RV marketplace in the late 60’s, a $100 million company has evolved. It is the dominant supplier to the RV, marine, general industrial and floor care markets. SHURFLO® has full service sales, service and distribution center in Elkhart, Indiana, but the hub of the company is at its facility in Costa Mesa, California. SHURFLO®’s culture can best be summed up as Innovation, Quality and Service. SHURFLO® is in the business of creating opportunities. Our growth and success over the years have been the result of our dedication to this philosophy. We provide opportunities for our customers by working in a close relationship with them, identifying the problems they face and offering solutions to satisfy their needs. Join our ZERO Home Bills Community. BEST Products from the BEST at the BEST Retail Prices available in your market on ZEROhomebills.com by Solaranna.